From the back of an elephant I’ve found joy tossing around in a box like saddle feeling the s ide to side rough roll of the elephant’s pace. 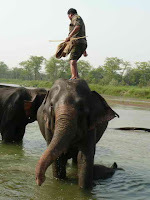 At 6 a.m. we set out on elephant with a rider, his legs wrapped around the neck of the elephant so he could give her signals with his toes against her ears, and a naturalist guide who stood behind. And we headed for the tundra, the deep grasses and reeds, the muddy paths and rivers. We were looking for tigers. It’s one of the things I want to see before I die - a Bengal tiger in the wild not behind the bars of a concrete zoo. The elephant "rover" was a rocking and rolling experience that probably would have shaken some peoples spine out of line. But I was so excited, remembering the excitement of the hunt on daily safaris we took when I lived in Tanganyika, albeit from a landrover then, as I got on my "looking" eyes trying to see if I could see anything swishing the grasses or some rock that might become a rhinoceros. There were plenty of rhinoceros, the one horned Asian kind, with skin divide d in to plates like knight’s armor, mostly covered in gray mud. We saw males and we saw females with babies. They hide in the tall reeds mostly, which was different from the black and white rhino of Africa, that preferred the plains. Mostly they looked like big boulders in the distance - and really there aren’t any boulders around here. We searched every nook and cranny for evidence of tigers and sloth bears. Both are evasive and not as apt to be caught napping under a tree like the African lions. So we pushed on and finally our attention turned to the multitude of birds - their music, their colors, their variety. Herons, babblers, cuckoo, etc. 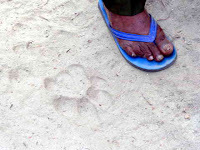 We found hog deer (I spotted that one with my glasses on - and believe you me - everything is so camouflaged that their short brown horns looked like sticks against the green to tan tall grasses) and footprints of sloth bear and tiger, but no bodies. So we gloried in the sunrise in a sky netted with smoke. In the mountains to our east they are burning the grasses and trees, as they do each year, and the rebirth or new buds become the best meals for the wild animals, but it’s tough on breathing for the rest of us. After breakfast, it was a time to prepare for the heat of the day. I had to sit out under a branch of shade to send off yesterday’s blog and photos and I was pouring with sweat. Jim’s satellite box picked up the signals with ease and I was able to send and receive emails as well. 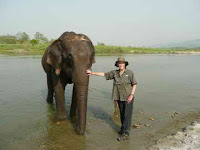 After a Nepali lunch, we had the opportunity to go to the elephant camp right next to ours rooms and so to speak with the elephants. Some were being prepared to go out to with their handlers to cut grasses for their meals. 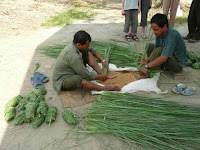 Other handlers sat on the ground making "sandwiches" or snacks for their charge from rice, seeds, grains, raisins and nuts, mixed and rolled up in long grasses to make balls, kind of an elephant gorp. An elephant can eat a hundred of these a day. A naturalist gave us a talk comparing Asian and African elephants: differences from the ears size, the ear rolls, the toe nails, and tusks and non-tusk, their attitude and train-abilities. Meanwhile, I watched the mama and baby interact about 15 feet in front of me. 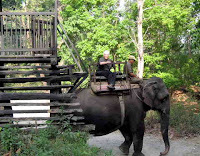 The trained eleph ants that are used for work and for our rides are chained, each in their own sheltered area, where they toss grasses in the air, flip them against their head and ears to remove the flies, then stuff them in their mouths. The trunk is an amazing finger or hand or arm. At times the mom reaches her trunk into her mouth, like she is sucking on it, and then pulls it out and sprays herself with the water she found within. Helps a cool out. The baby sleeps right under the mother’s stomach at time, and you hope the Mom doesn’t make a false step. A couple of stalls down was the bull elephant with long ivory tusks, actually born at Tiger Tops, patiently waiting his afternoon two hour labor, carrying tourist. After the lecture, we walked behind a chain of elephant to the river t o watch them bathe and to put a hand in at rubbing their dry and wrinkly skin or tossing a handful of water over them. That was about all we could do. The elephants are completely dependent on their three caretakers, who are assigned to them for life. There is a loyalty there about which men from the rest of the world could learn. But as the heat waned, the day had not ended. We loaded up on another elephant, her name Sundra Kaili. She was small. She was the quickest elephant in the herd. She was the one who enjoyed a tiger hunt. The driver was a young Nepali with the best sense for tigers in the area. We couldn’t miss. I can’t say sweet Sundra had a comfortable gate, in fact one has to hold on for dear life. But she knew her stuff and no matter how deep into the water we went - crossing some streams that were almost up to my feet hanging over the side - to the tallest reeds and grasses with no path to follow, Sundra and her caretaker made it through with vigor. I was in a trance of fascination. We went on like this, watching the tiger prints in the dust, and even a place he had laid down under a tree (not in the open like lions of Africa) for ninety minutes. Tree b ranches and sticks and reeds brushed passed us, as we dodged. 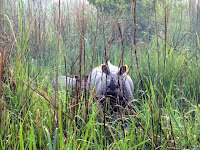 We saw rhino of ever flavor - moms, calves, papas, some in water, some on the land - and plenty of birds. But who was looking for birds. My eye was on the tiger. All of a sudden as we came out into daylight from under the jungle canopy I noticed on the other side of the small river were about seven other elephants carrying tourists from other camps. They were on OUR trail because they sensed something was up. 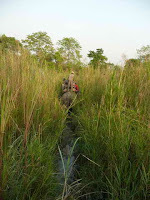 Our driver would start kicking Sundra behind the ears at a mad pace and whop her on the head with a soft bamboo stick to make sure she paid attention to the command, and we went up and down like a seasaw - and then leaped into the swamps of mud and reeds, trying to see something. There he is, shouted Dan our guide still standing behind. See him? See him? All I could see was mats and masses of reed and grass. 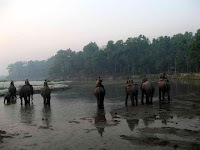 Then Sundra and another elephant kind of formed a V and all of a sudden there was trumpeting of the elephants, and my travel guide Jim yet out a yell (I thought t he tiger may have jumped on him) and all the drivers were shouting in their language. I think this was what they called "flushing out the tiger." It was so intense, Sundra was trembling, like a dachshund, her trumpet up in the air like an antennae. Then suddenly leaping into a very small patch of clearing was the most beautiful beast I have ever seen. A young male tiger. My camera (which had good pictures of the reeds) went black. No more battery. So I just watched this sort of agitated young tiger, his orange, black and white stripes shining in the afternoon sun, show his teeth, ripple a low grrrrr sound (not a roar) and look at all the commotion around him, then dip back into the refuge of the reeds and swamp. WOW. All I can say is Wow. A thing of beauty, a joy f orever. A tiger. Everyone was happy because tigers are hard to find these days. Bengal tigers are disappearing, although there are rumors of a mother and two cubs in this area. Also this is a young tiger who has been in the area only about two months. One day he’ll have to contend with the larger, older tiger who has lived here 15 years. They are warriors about their areas and their females. We road back with Sundra leading the rest in her fast pace, passed more rhinos, which we sort of pooh-poohed. I no longer felt the swing of Sundra’s gate. I had seen what I came to see and if I never reach another goal, this one counts as the best. Photos: Riding the elephant; rhinos in pairs; making sandwiches; working on the river; Washing an elephant; a kneeling elephant; washing mama and baby; tiger print; through the reeds; The Tiger.